Have you been to Chandlerville yet? You will be, if Rocco Termini has his way. 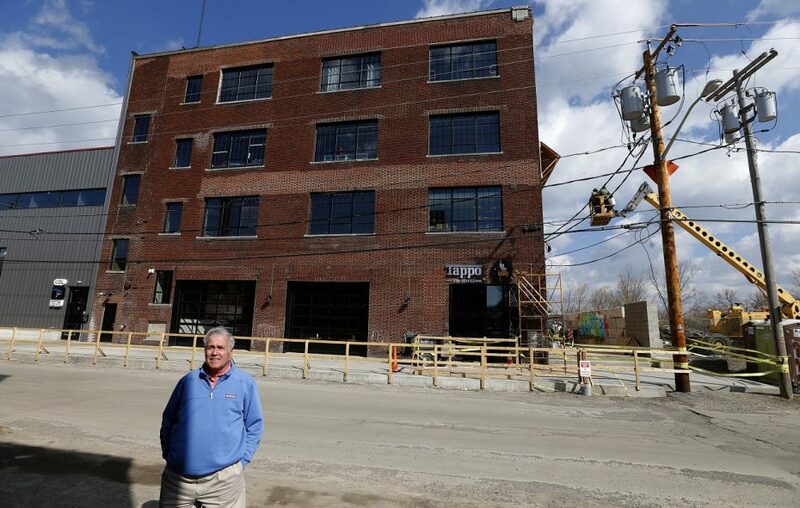 The developer who led Ellicott Street’s restaurant resurgence with Tappo and the buildings that became Toutant and Seabar has been working on laying the groundwork for a new Buffalo drinking and dining destination district. In Black Rock, two blocks north of Amherst Street, Chandler Street runs through a cluster of former industrial buildings. When he’s finished, $50 million will go into reshaping the neighborhood, Termini said, with tech companies, accountants, a gym and salon already in place. In years to come, the emphasis will shift to food. 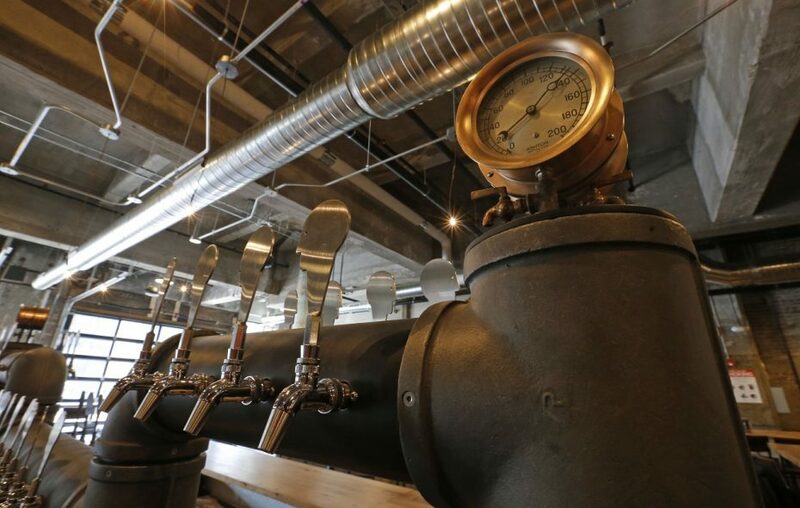 Spaces that once saw the production of airplane parts and BarcaLoungers will be turning out craft beer, wood-fired pizza, cider, pickles, seasonal kombuchas and kimchi fried rice. Food & Drink newsletter: Sign up here to receive restaurant news and anything else you need to know about Western New York's dining and bar scene, delivered directly to your inbox once a week on Fridays. 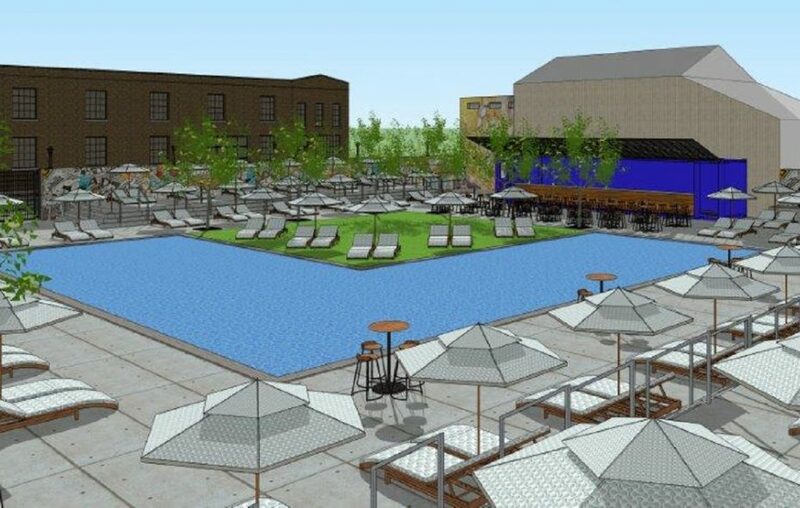 Lounging beside a new private pool, visitors will be able to order via smartphone baked-to-order pizzas and icy cocktails delivered to their lounge chair, Termini said. The pool isn't scheduled to open until next year. On Friday, the official Thin Man Brewery opening will occur at its second location, 166 Chandler St. Drinkers can explore 14 varieties of craft beer, which eventually will be made fresh next door in the new $3 million brewing plant, a couple of outside brews and a full bar. In its restaurant, Tappo Pizza will be serving pizza plus Italian and brewhouse favorites. Across the street, in the former Linde Air building, Buffalo Cider Hall will continue serving varieties of Blackbird Cider and other drinks, with a light food menu, while making test batches of new cider varieties. Barrel + Brine will be offering a dynamic daily menu of fermented and seasonal vegetables and seafood. There’ll be Bloody Mary-fueled Sunday brunches featuring eggs over kimchi fried rice and house-cured salmon, and occasional cameos by meaty specialties like smoked prime rib sandwiches. Foodie, the food business incubator at 27-37 Chandler St., will be home to another restaurant, run by an operator Termini declined to name. That building also will hold Flat 12, the indoor mushroom farm. Termini’s more distant plans might change as the developer improvises on the fly, but what’s opening in the next few months deserves elaboration. Customers who’ve eaten at a Lloyd Taco Factory will be familiar with the Tappo Pizza setup. Customers step up to a counter beneath the menu to order their food and soft drinks, paying and providing a phone number. Alcoholic beverages can be ordered from the bar a stone’s throw away, or a server. The space has large television screens, room for about 150 people, and an assortment of games, including darts, Skee-Ball and foosball. 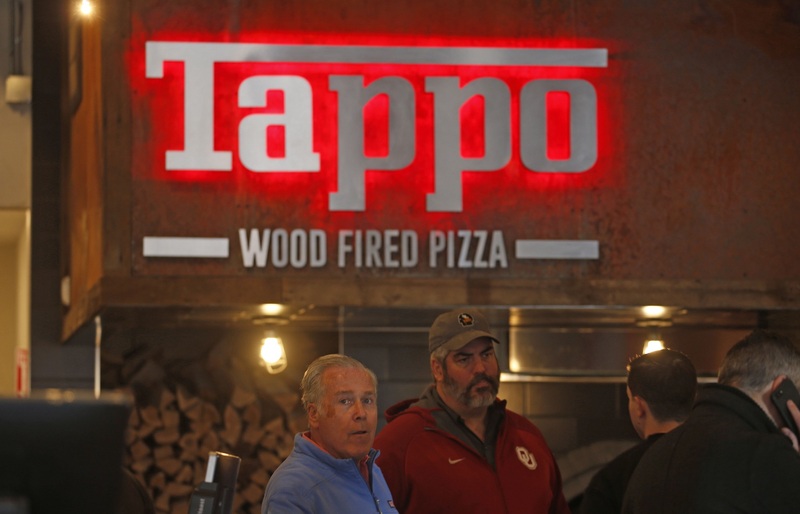 Underneath a glowing Tappo Pizza sign are two wood-fired ovens. One oven is for pizza, one for other food. Limina is working Thin Man beers into much of the menu, like stacks of thick-cut onion rings ($10), Bliss-IPA-battered and fried, with a Burning Money honey mustard and a Buffalo Pils cheese sauce. Wings ($11), in sauces including a barbecue sauce made with Black Francis stout, will be going from fryer to grill to heighten their essential crispness, Limina said. The kitchen also will put out bowls of beans and greens with sausage ($9), and calamari ($12), tossed with lemon, pickled Fresno peppers, arugula and Parmesan cheese. A second-floor banquet room, lined in old barn lumber, can hold more than a hundred people, and has its own satellite kitchen. Banquet-goers will be able to peer through a glass wall into a room full of hundreds of bourbon, brandy and wine barrels, patiently barrel-aging Thin Man vintages. 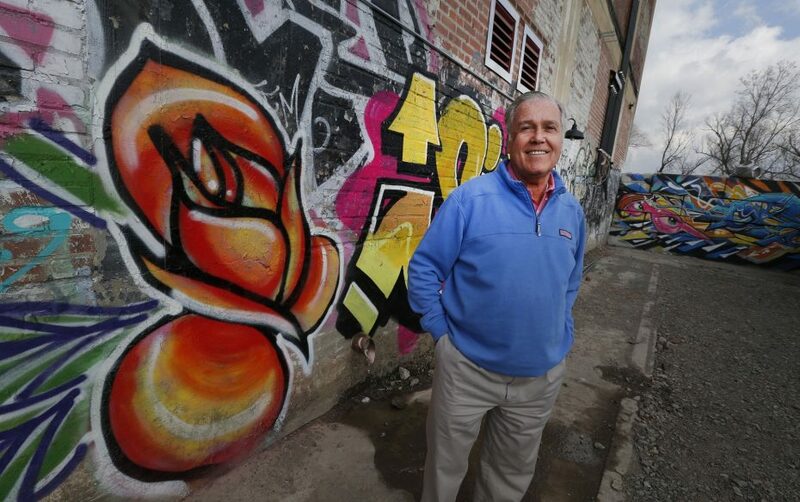 There’ll be a patio on the street side of the building, and another one alongside Tappo Pizza, splashed with original and artfully added graffiti-style wall art. Between them, they’ll hold another 140 people, Termini said. The other side of the building offers glassed-in views of the new Thin Man Brewery production space, in a newly built structure. 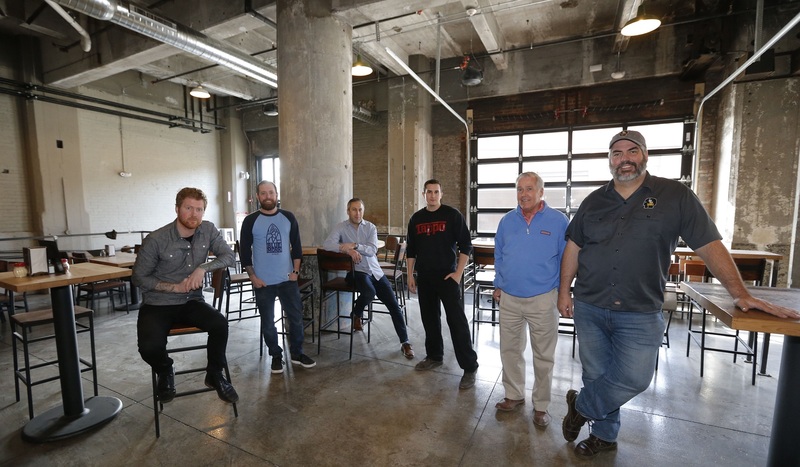 The new brewery, including a canning line, will allow Thin Man to market its beer across the northeastern U.S. Brewmaster Rudy Watkins should have beer brewing by May, said co-owner Mike Shatzel. The plan is to produce 6,000 barrels on Chandler Street this year, Shatzel said, about three times the Elmwood Avenue site's production. Canning will help with its branding reach and make it possible for Thin Man to appear in Wegmans and Consumer's Beverages across the state. Once Thin Man production is up to speed, the company has contracts to sell initial supplies to distributors in Pennsylvania, South Carolina and New Jersey, Shatzel said. Discussions are underway elsewhere. Across the street, 155 Chandler St., Barrel + Brine’s RJ and Lindsay Marvin have moved their fermented foods facility into a space that’s just under 4,000 square feet. It’ll hold a production area, café and taproom. The menu will be “vegetable heavy,” with lots of fermented ingredients, from pickles to vinegar and kombuchas, RJ Marvin said. Vegetables will take center stage in many dishes, with kimchi fried rice and Moroccan stewed chickpeas with egg. There will be hangover-cure brunches with Bloody Mary flights, local beer, wine, cider and liquor. With a brewer’s license, Lindsay Marvin can expand her kombucha experience to do wild-fermented beers and kombucha beers. Their place will have 10 taps, six dedicated to kombucha. Seafood such as smoked salmon, cured tuna and herring will make appearances, said RJ Marvin, as he tries to “bring over that Russ & Daughter’s aesthetic to Buffalo,” referring to New York City’s famed Lower East Side shop. Sunday brunches should echo the cult classics that RJ Marvin offered while cooking at Blue Monk and Elm Street Bakery. “We’re hoping to open in May,” he said.